Jeanine Serralles, Michael Braun, Bhavesh Patel, and Jennifer Lim in Don't You F**king Say A Word. Photo by Hunter Canning. BOTTOM LINE: An agile, energized battle of forehands and egos. Brian and Russ are tennis partners. Russ (Michael Braun), late thirties, has a volatile temper, an absentee father, a stunted acting career and a hitch in his backhand. Brian (Bhavesh Patel), forty, has a habit of cheating, divorced parents, trouble landing a job, and a weak serve. This is the rundown given by Leslie and Kate about their boyfriends in the opening moments of Don’t You F**king Say A Word as they begin their investigation of “the incident” that occurred between the two men. The two women (an expertly paired Jennifer Lim and Jeanine Serralles) are co-narrators of a probe into a singular tennis match between Brian and Russ—"the day their friendship, or whatever it was, came to an ignominious end," an exercise to uncover the je ne sais quoi of the male experience and of male friendship. 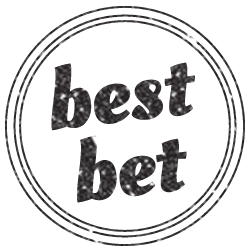 Playwright Andy Bragen delivers a dexterous and controlled piece of writing, moving the narrative suddenly from the action of the last match, to encounters between the two couples, to previous matches, and eventually to the aftermath of their falling out. As the play volleys back and forth between partial scenes, we learn of a humid September morning, of an early one-set-to-none lead for Brian, of a mid-match episode at the water fountain. As the nuance of the match comes into view, so does the richness and emotional complexity of the relationships. There is a kind of sumptuousness to the banal details this play rolls carefully back and forth over. You are charmed by the rhythm of a tennis fanatic’s routine and by the mania of their obsession. You become enthralled by the peculiar way a tennis match unfolds, the trajectory of a season, the mind games, the inner monologues. 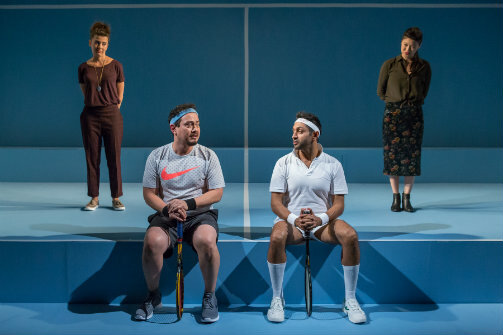 These frivolous idiosyncrasies of the amateur athlete are elevated by the play, and in particular by Lee Sunday Evans’ elegant stagecraft as she renders the astonishing speed and agility of tennis in rich, arresting theatrical detail. Amy Rubin provides a smart and efficient container for the play in the form of a wall-to-wall blue concrete treatment that both frames the stylized movement, and underscores the veneer of congeniality that envelops these four characters. Across the production (notably created by an outstanding all-female design team) there is a bizarre-yet-elegant chord that is struck, and which resonates with the sense that for these characters, there is a kind of triviality that sits right next to a very deep, very essential intimacy. Skillfully treading this line, Patel and Braun are delightful as tennis rivals, each struggling desperately to hold ground as the superior athlete and, by extension, the superior man. Watching this play shortly after the general election, at a time when divisiveness and animosity seem to overwhelm, Patel’s monologue in the penultimate scene offers a sobering reflection on the privilege and transience of friendship and human connection—a welcome, unexpected moment of lucidity. The play ends quietly, with Kate and Leslie sharing their own unexpected moment of agreement, “straining a little” as Bragen’s stage direction suggests, for compromise, for affection, for intimacy. Their strain might inspire our own. Don't You F**king Say A Word is by Andy Bragen. Directed by Lee Sunday Evans. Set Design is by Amy Rubin. Lighting Design is by Masha Tsimring. Costume Design is by Asta Bennie Hostetter. Sound Design is by Amy Altadonna. Prop Master is Emilie Grossman. Stage Manager is Karen Evanouskas. The cast is Michael Braun, Jennifer Lim, Bhavesh Patel, and Jeanine Serralles.